1 of 2 In small bowl, blend whole-berry cranberry sauce, light mayo, red wine vinegar and Dijon mustard. 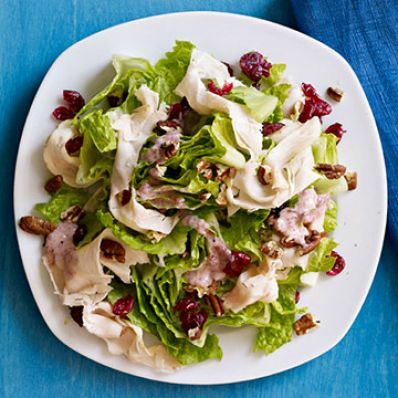 2 of 2 In serving bowl, combine hearts of romaine, smoked turkey, chopped toasted pecans, dried cranberries. Drizzle with dressing and serve. Per Serving: 683 mg sodium, 5 g fiber, 2 g sat. fat, 28 mg chol., 13 g pro., 293 kcal cal., 16 g Fat, total, 28 g carb.